Featuring patented Coaxial Differential Dispersion technology, the CDD-WR range delivers improved coverage and consistency, with the need for fewer speakers than those with traditional fixed dispersion X° x Y° horns, and is designed for outdoor operation where it will be subject to changing environmental conditions, but sheltered from direct exposure to the elements. Weatherised mounting brackets are also available. 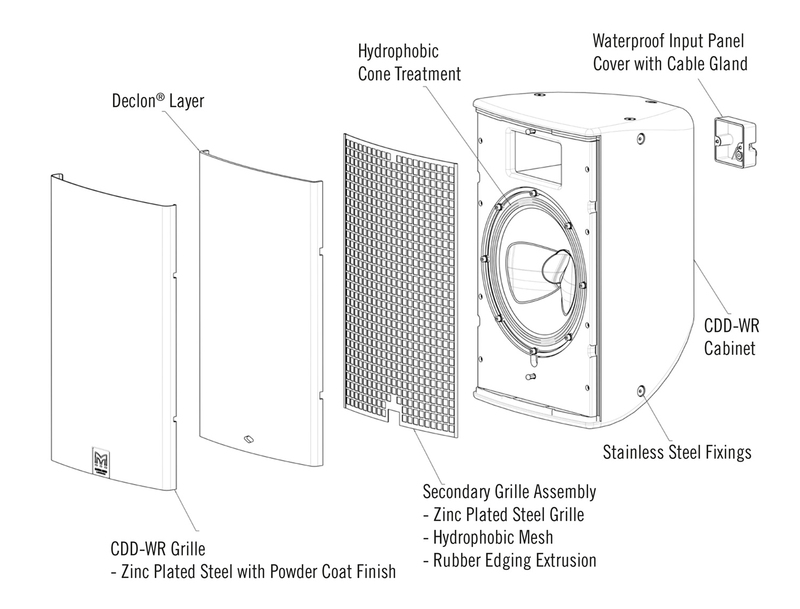 CDD-WR loudspeakers meet a rating of IP54 and feature a weatherised water resistant grille made from zinc plated mild steel with a powder coated finish. CSX-WR subwoofers in the series have an IP24 rating and feature a zinc plated mild steel grille with powder coated finish, plywood cabinets with polyurea finish and are flyable with stainless steel fixings.